Summer is the perfect time of year to get outdoors and enjoy water activities on the Arkansas River, which flows through the heart of Wichita. There are three easy ways to get out on the water this summer. The best part? You don&apos;t need equipment of your own to participate in any of them – the fee will cover your rental. Prior experience isn&apos;t required either; each float begins with a short training. You will, however, want to make sure you’re up for the task, because even though the float is leisurely, it’s still a physical activity that lasts a little over an hour. 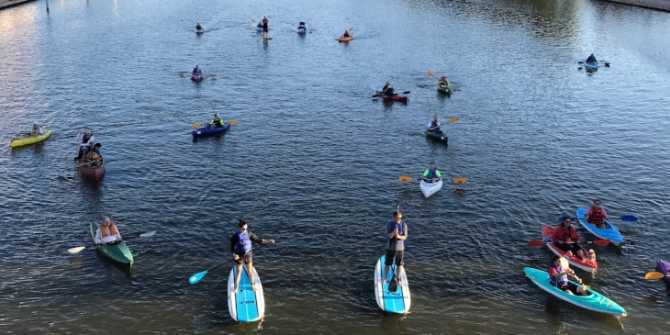 The City of Wichita Park & Recreation office and SUPWichita are offering a series of sunrise and sunset stand-up paddleboard (SUP) and kayak tours along the Arkansas River this summer and fall. The last tour of the season is Saturday, Sept. 7. Paddle at a leisurely pace on the river from Old Cowtown Museum to the Wichita Boathouse. This route will provide a stunning view of the Keeper of the Plains, an iconic landmark at the confluence of the Big and Little Arkansas Rivers. Afterward, gather for music and food, included in the participation fee. This activity is recommended for ages 12 and over. In addition to the scheduled Sunrise and Sunset Tours, open kayak & SUP rentals are also available on Saturdays this summer. Participants will receive some basic instruction on paddling techniques and safety, then take off for a leisurely float down the Little Arkansas River. These are available on a first-come, first-served basis from noon to 3 p.m. each Saturday this summer through Aug. 18. The Arkansas River Coalition organizes floats on the river about once a month and can loan out equipment for the floats. These trips are for all skill levels and children are welcome if accompanied by an adult. A typical Saturday trip will cover eight to 10 river miles at a leisurely pace. The coalition also organizes summertime weekday floats from 5:30 to 8:30 p.m. on the Arkansas or Little Arkansas rivers. A schedule and details on floats are available here. Make plans now to get out and enjoy the river this summer. Throughout the year, visit our calendar of events page to find things to do while visiting Wichita.